Mazda knows how to create appealing exteriors that turn heads on the road, but more importantly they also understand driving dynamics. Every Mazda I’ve driven has handled the road in a way that’s made me want to spend more time driving. Now, Mazda’s latest re-design, the 2019 Mazda3 aims to usher in a bold new era. 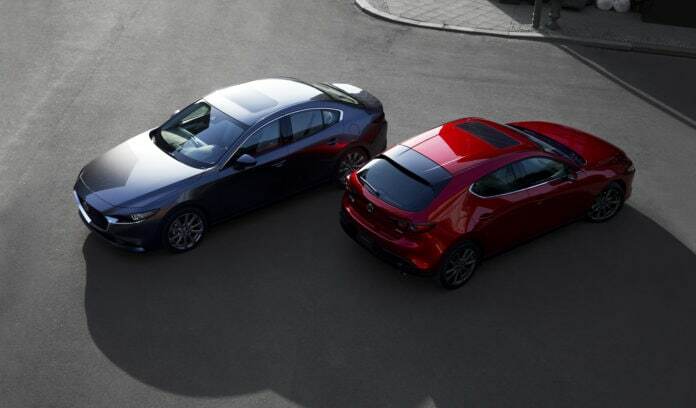 The new Mazda3 combines beautiful design with “exhilarating driving dynamics”, developed to inspire and create an emotional bond with its customers in two very distinct ways. With an emphasis on elegance and sleekness, the sedan and hatchback have strikingly different personalities. Manual fans rejoice, Mazda will offer an available SKYACTIV-MT six-speed manual transmission in Mazda3 Premium package front-wheel drive hatchbacks. The Mazda3 sedan body features a horizontal flow that accentuates the look of a wide and low stance, designers want to while present a calmness that appeals to a sophisticated audience. Whereas the hatchback is meant to be sportier and more emotional, featuring aggressive body sides and C-pillars that do away with traditional body lines and adopt constantly shifting reflections. The hatchback design is topped with a roofline that suggests speed and helps express a powerful presence. Exclusive to the Mazda3 hatchback, Polymetal Gray is a newly developed exterior paint option that fuses the hard appearance of metal with the glossy, smoothness of plastic to create an entirely new expression of style. 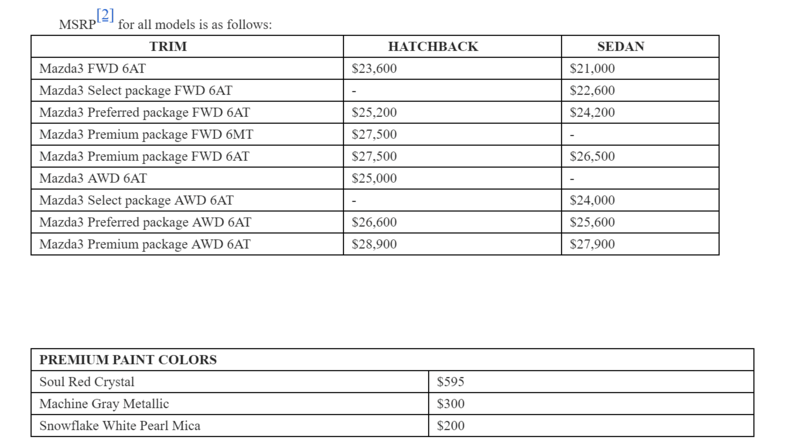 Also, the new Red leather interior color is exclusive to the Mazda3 hatchback and offers a deep, vivid appearance that helps heighten the emotion of the exterior design. Mazda will offer the 2019 Mazda3 sedan in Select, Preferred and Premium packages, while the 2019 Mazda3 hatchback will be offered in Preferred and Premium packages. All 2019 Mazda3s come equipped with a SKYACTIV-G 2.5-liter engine that is rated to deliver 186 horsepower at 6,000 rpm and 186 lb-ft of torque at 4,000 rpm. While front-wheel drive is standard, Mazda’s predictive i-ACTIV all-wheel drive is available on the Mazda3 hatchback and Mazda3 sedan option packages. On the inside, customers will find an all-new interior and cockpit. 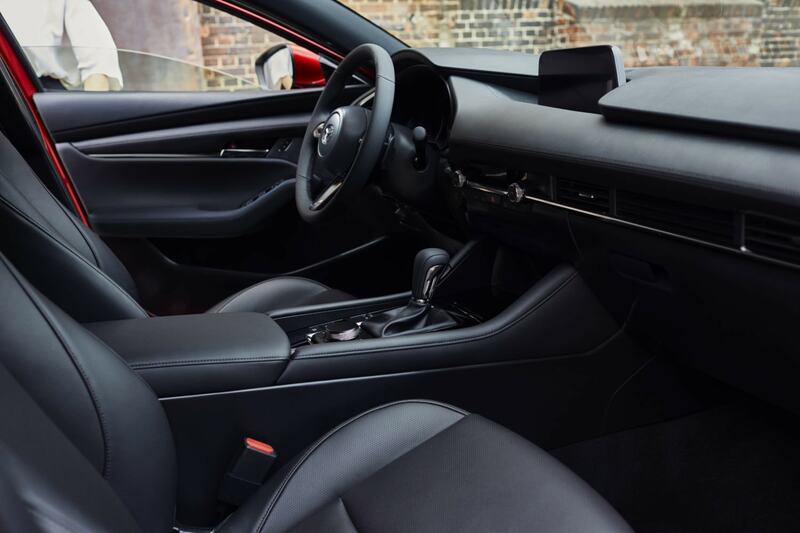 Mazda created an environment that helps drivers experience a perfect fit and connectedness while driving the 2019 Mazda3. The center console has been redesigned with the shift knob, new commander control and armrest moved forward, while the cupholders are repositioned to the front. 2019 Mazda3 is the first to introduce an all-new 8.8-inch MAZDA CONNECTTM infotainment screen to the brand, which comes standard on all models. Also standard is an all-new 3-way layout 8-speaker sound system, new steering wheel design featuring illuminated controls and switches, 7-inch TFT reconfigurable gauge cluster display, LED headlights and taillights, Bluetooth phone and audio pairing, HD radio, remote keyless entry, push-button ignition, electronic parking brake, new knee air bags, rearview camera and two USB audio inputs, along with other standard features. The 2019 Mazda3 offers two new interior color options. First is a new Greige leatherette interior color that combines the cool tones of gray with the soft feel of beige to create a pleasing sensation of vitality, warmth and sophistication. Visit your local Mazda dealership in March to test drive the 2019 Mazda3 or see them in person at the Houston Auto Show or upcoming DFW Auto Show March 27-31. Next articleCaptain Marvel: Who’s The Star?